When I looked at the clock this morning it said 3:31. I woke up because I wasn't liking my dream. At all. I found you. I was so excited to tell Mom. I found you in a tunnel under the ground. And at its end, the tunnel opened up to the light. I read a story in the paper yesterday about funerals. It said that people should plan their funerals when they're alive to save their family from having to do it. It said some people build their own coffins. I wonder if this is why I had the dream. In the dream I had on Friday night I was starting medical school. Wherever it was it looked like the 1950s - old, a lot of wood and kinda dark. I was excited and scared. I was scared because I am not very good at math. We went to the cemetery two weekends ago. It was Grandma's yarzheit. I bought two bunches of flowers to put on your graves. It was so windy -- there were 50 mph gusts -- that I had to put your flowers under a really big stone. I kinda buried them. I was the only one who dressed for the weather. Mom and Jack and Joe were pretty cold from the wind so we only stayed a few minutes and then jumped back in the car to warm up. Jake, David Lane and Cousin Sam have all slept over recently. When I was driving the babysitter home - we have these really nice students from Georgetown University, Carolyn and Jenny, who switch off watching the guys after school and babysitting - she said to me that David Lane is really nice and he is good with both Jack and Joe. Mom and I have noticed the same thing. He gets along and plays with your brothers both really nicely. That is how Mom and I think you would have been. Chuck has a book coming out. Rich is having a book party when we get home. Very excited for him. I am looking forward to reading it. 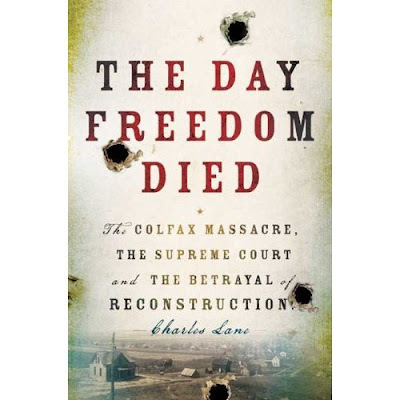 The book is called The Day Freedom Died. Last weekend we went to a performance at Strathmore which Shelly and Mike wrote. It was about the first ever African American opera company. We just went out with them to Cactus about a week before that. Nick and Jeffrey have grown up into really terrific guys. Joe plays chess. Remember how you and Jake played online. Joe, as usual with him, wants to play from the second he gets up right up until the moment he closes his eyes to fall asleep. Mom indulges him. Me, I don't have Mom's patience, so when I don't feel like playing I set him up on my laptop so he can play against the computer. I started out on the "easy" setting and he quickly moved to "hard." I think he is pretty good. Joe refuses to take any kind of lessons, swimming, riding a bike or skating (I am writing this at an iceskating party for a friend of Joe's, Gigi. Mom says he needs lessons but he doesn't want any. He does want to take guitar lessons. Jack taught him Smoke on the Water. I wonder if you had musical talent. I don't have any; Mom does. Maybe you got that from Mom. Last weekend was a bowling party for Allison's birthday. Remember Allison. She's Joe's "girlfriend." Paula, Andy, Emily, Sam, Jacob and Joey came over for Shabbat dinner on Friday. Andy played our piano and it was awesome. Emily and I sat and read while listening to him. The boys all played video games and Mom and Paula chatted. Ken and Suzie and Eli, Evie and Samara came to stay with us a couple of days last week. The last time we saw them was when we were up in New York in November and everyone was pretty sick. They stayed at our house and went to see the monuments and the museums. One night we went to Cactus for dinner. Eli played chess with Joe. I think they all had a good time. I read something the other day about a song. In it the songwriter says he needs to remember not to start a sentence with "remember." I had a girlfriend who, after we broke up, once said to me, "don't reminisce." I don't understand that. I do remember exactly where we were when she said that. We were in my car driving up Wisconsin Avenue around Tenleytown. I believe she was saying that I shouldn't romanticize the past. I think she meant we were over, so it wasn't worth talking about. But that isn't me. I am always thinking about the past. But thinking about the past and not living in the past are different things. On Tuesday we are going away with Richard and Helaine. Nana is going to come over and stay with your brothers. It is our 4th year doing this. I like traditions. Having done this for so many years, we now know exactly how long we can go away before we go crazy missing your brothers. Jen Klein told Mom she went to a funeral of a kid named Henry. His little brother is Jack. Pretty sad. Remember I told you that Joe likes a girl. Here she is. Her name is Allison. This is too funny. I am sorry I haven't written. I have been trying to finish something at work. I'll post an update. The back door slammed, and perky, smiling Maddie Landwehr, home from school, ran straight into the living room and hugged her dad. The 7-year-old girl gobbled down three chocolate chip mini-muffins, did a cartwheel and told her parents, again, that she wants to go to Disneyland. 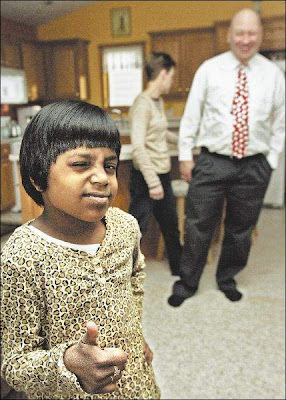 Amazing, given what this child has gone through, what she endures every day, and what she faces. "Maddie has had nine surgeries," said her dad, Ernie Landwehr. They counted. She was right. But that's only part of this child's story. Maddie was 2 years old when she was adopted by Ernie and Nancy Landwehr of Altoona. It's when orphanage workers in India told them of the horror of how the girl's life began. Born to an unwed, teenage mother, Maddie - whose full name is Madison Aditi Landwehr - literally was "thrown away" moments after her birth and left to die in a remote area of central India. Lying in the open, she was mauled by wild dogs. Her right buttock was devoured, as was her hip. That destroyed a growth plate, which allows a child's leg to grow properly. She was near death when she was found and carried to a hospital, where doctors saved her life. She weighed only 4 pounds. Four months later, she was taken to an orphanage in western India, and that's where she stayed for a year and a half until the Landwehrs brought her home to Iowa. "It was terrible, unimaginable, but I guess that's obvious to anybody who hears the story," said Ernie, a college admissions official. "I just know that when we saw her picture and then when we saw her with our own eyes, we knew that this is our little girl." Which should be the beginning of a happy story. And, through all those surgeries to fix her leg and help her walk, a story that should bring a happy ending. Not yet. Maybe not at all. Ernie and Nancy learned last year that their happy, beautiful little girl has an inherited, rare blood disease called Fanconi anemia. It prevents her red and white blood cells and platelets from reproducing as they should. People with the disease are likely to develop serious infections and cancer-related illnesses, particularly leukemia. That means Maddie needs a bone marrow transplant to have a chance to survive. So far, no suitable donor has been found. "We're told that any suitable donor will almost certainly have to be of Indian descent," said Nancy, a stay-at-home mom who with Ernie has three grown biological children. "There are a lot of people of Indian descent in Iowa and around the country, and we're trying to get the word out and encourage people to be tested." Any healthy person between the ages of 18 and 60 is eligible for testing. Their blood cells are examined after a quick, painless swab of the cheek. Information from the swab is entered into a database, and a computer analysis determines if a person is a suitable donor. The 2000 census, the most recent count of Iowans with a reliable breakdown by age and race, found 3,751 Asian Indians between ages 18 and 60 living in Iowa. It's likely that number is higher today. The donor can come from anywhere - there are 6 million names on the worldwide bone marrow donor registry. Ernie and Nancy are certain that somebody, somewhere, can save their girl's life. It's just a matter of finding the person. The thing is, while Maddie seems healthy - spend time with her and you'd never know she was sick - she can't wait long. "She is very sick, and she definitely needs this bone marrow transplant," said Dr. Deborah Smith-Wright, a Des Moines native and a pediatrician at the Shriners Hospital for Children in Minneapolis, who has been caring for Maddie since 2005. "Spontaneous remissions are extremely rare in Fanconi anemia patients." Smith-Wright said there are only about 1,000 cases of Fanconi anemia worldwide. "Maddie has been through so much," Smith-Wright said. "The injuries, the infections, the treatments and now this. It's been a rough time for her, but she's a brave girl. She's a real favorite around this hospital." Her first surgery was 3½ years ago and was an initial step in repairing her hip and lengthening her right leg, which was not growing as it should. "The doctors in India did their best, I'm sure," Ernie said, "but doctors here told us she looked like she'd been sewn up in a hurry by a vet." She was in a body cast for eight weeks after the first surgery in Minneapolis - the first of three such casts. But her blood tests indicated a probable infection. Her white blood cell and platelet counts were at a critically low level. "She wore a thick-soled shoe on her right foot to even out her legs," Nancy said. "It was so she could walk reasonably normally. She hated it. It was like wearing a brick." The first leg-lengthening surgery was last March at the Shriners' hospital. The leg was attached to a crank-like device, which had to be turned four times a day for 45 days. "Maddie is the one who turned the crank," Ernie said. "Her leg grew a little over 4 centimeters." Other than a short time in a wheelchair, she never stopped walking. There were more infections, more drugs, more surgeries and injections, including the strong antibiotics she is given through a port in her chest three times a day. "The Fanconi anemia, we never imagined such a thing was possible after all she'd gone through," said Ernie. "She was sitting here one night, and all of a sudden her nose started bleeding. I put a towel over it. It wasn't long before the towel was soaked with blood. We had to call an ambulance. I couldn't believe she could have that much blood in her little body." The infections, the bleeding and sporadic blood counts led to the tests that confirmed Fanconi anemia. The orthopedic treatments have been done at the Shriners' hospital at no cost to the Landwehr family. 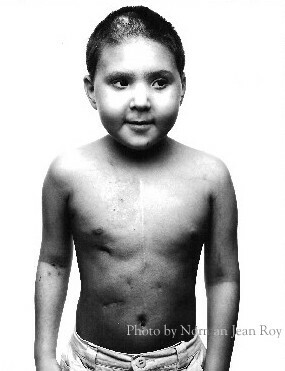 The bone marrow transplant would be done at University of Minnesota Hospitals. "My daddy tells me I have special blood," Maddie said, listening as her parents describe her illness and treatments. "He says I have angel's blood." Friends have created a Web site, "helpmaddie.com," which tells her story and gives information on how to donate money to the family to help with travel expenses. The Web site also lists fundraising events to help the family, such as a Feb. 23 pancake breakfast in Maddie's honor at Clay Elementary School in Altoona, where she is a second-grader. Maddie is small for her age - she weighs 30 pounds - and wears three little silver rings on her tiny fingers. "I love jewelry," she said, giggling. She wants to meet Faith Hill. She wants to ride a bike. She loves school, and her favorite things at Clay Elementary are, in order, recess, science and math. When she grows up, she wants to become a doctor. "I want to help sick people," she said. But all of that depends upon finding a donor. "It's not critical today," said Nancy. "She's getting along fine - today. Next week, it could become critical. Or next month. We just don't know." "It's not a matter of if this kicks in," said Ernie. "It's a matter of when." They have talked to some of the best doctors in the world and have done their own research. They know that Maddie could be expected to live only to the age of 12 without the bone marrow transplant. With it, she might well live into her 20s or 30s or longer. And by then, with ongoing research, who knows? "What we are certain of is that she needs the transplant to save her life," Nancy said. "It would be wonderful if everyone got themselves tested. The chances are you can save a life. If you're of Indian descent, for Maddie's sake, we ask that you please be screened as a potential donor." Maddie understands - at least as much as a 7-year-old can comprehend such a thing - and she's ready to deal with whatever comes next. "Somebody will help me," she said. It would, everybody in this family knows, be the ultimate gift. But Ernie said the greatest giver of all has been Maddie. "I can't measure what she has done for us," said her dad. "I can't imagine what our lives would be like without her. She is the joy of our lives. She has courage and great humor and a spirit unlike any I've ever seen." With the help of somebody they have never met - possibly somebody they never will meet - she will be in their family for a long time. Joe is student of the week in his class this week. For his classroom, Joe, with Mom's help, prepared a poster filled with photos of the family and things important to him. 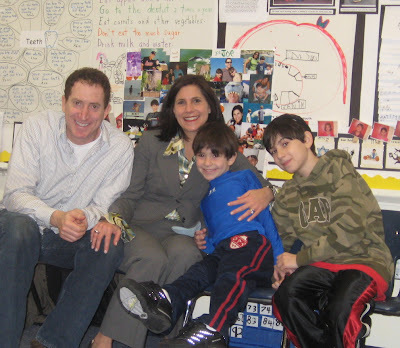 Today, Jack and Mom and I went to Joe's class to share in student of the week activities. We sat with the class and they asked Joe questions to learn more about him. They asked him his favorite food, color, travel spot and movie. Someone asked Joe how many siblings he had, and your brother pointed to Jack, and that was that. That made me pretty sad. It is understandable. You aren't on his radar, but it still can make me sad. And then Joe was asked to point out his favorite pictures on the poster. He pointed to one of him playing baseball and to the one next to it, which was one of two photos with you. When asked why those were his favorites, he explained that he loves playing baseball and he loves real baseball players. He was referring to Cal Ripken, who was sitting beside you. That broke my heart a bit. Okay, a lot. Then we went to the gym to play "Freeze Tag" which is what Joe chose as his special student of the week activity. Of course we passed by your plaque on the way there. In my heart I kept wanting to shout, "Hey Joe, tell them about Henry, your brother Henry. You know, your older brother who loved you and who also had Mrs. Berliant as his teacher. He loved baseball just like you." But all that was something best to keep inside. Jack didn't say anything. Mom didn't say anything. I didn't say anything. And that was right. It was fine. What mattered was Joe and his classmates had a great time.